Neverland Manila: Are You Ready for the Ultimate EDM Festival? I know that I repeatedly mention that I am a rocker chick at heart, but I also have those moments where all I wanna do is let loose and party the night away! Do you have your tickets yet? Will I see you there? Let me know! :) I personally cannot wait to dance the night away with my fellow EDM-loving friends. Are you ready for the best night of your life? I know I am. Just remember these two words: Neverland Manila. Neverland Manila will be held on October 3, 2014 at the SM Mall of Asia Concert Grounds. 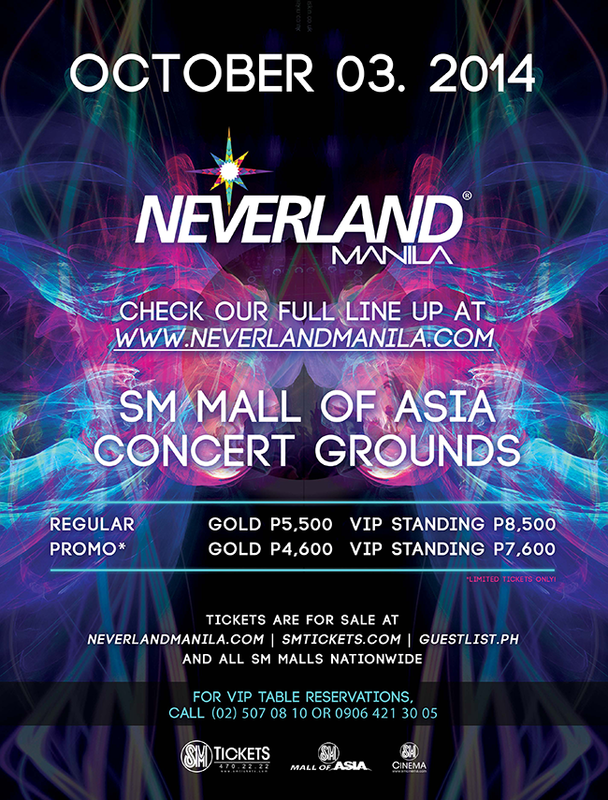 Get your tickets before it’s too late at the Neverland Manila website (www.neverlandmanila.com), smtickets.com, and all SM Tickets outlets nationwide.